Outdated countertops can affect the entire look and feel of your kitchen, but replacing them is a major project that can cost you time and money. Surface refinishing from Miracle Method of Brampton in Georgetown, ON, is a bath and kitchen remodelling alternative that can update your kitchen or bathroom for less. Our trained technicians can have your old countertops looking like new without going through the hassle of having them replaced. 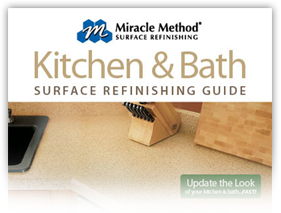 The surface refinishing services offered by Miracle Method of Brampton cost 75% less than what it would cost to replace your kitchen and bathroom fixtures. This makes it possible to have the home of your dreams without exceeding your budget. Visit our showroom on Armstrong Avenue in Georgetown to learn more about our services. Call today. WELCOME TO MIRACLE METHOD OF BRAMPTON! We poudly service Brampton, Georgetown, Milton, Acton and the surrounding areas as well as Orangeville, Caledon Mississauga, Toronto and Oakville. Due to increased demand we have recently expanded into Acton, Erin, Hamilton, Rockwood, Vaughan, Richmond Hill, Thornhill, Toronto & the GTA. If you are not sure if we work in your area please give us a call. Miracle Method is the premier surface refinisher in the southern Ontario region. With more than 35 years of experience and over 150 franchises in North America, Miracle Method has the expertise to resurface your tile, laminate, fiberglass and many other surfaces. We do our work professionally and quickly; most often in less than 2 to 3 days! Let Miracle Method help you update your existing surfaces, change colours or make old tired finishes look and feel like brand new. We are proud to be also install a Step Thu - Tub to Shower Conversion unit as well as slip resistant surfaces, grab bars, curved shower rods, and other safety products. A perfect solution for people with disabilities or mobility challenges. We have expanded our services to include the refinishing of Kitchen cabinetry and countertops. Miracle Method is the premiere Surface Refinishing Company in South Eastern Ontario and we employ a full complement of technicians, estimators and office staff to provide professional and prompt service. Miracle Method of Brampton provides only the highest quality products and service the industry has to offer. Our attention to detail and customer service orientation helps to ensure your satisfaction. All work is guaranteed for both Commercial and Residential Service. Please call our office for a free - no obligaton estimate, or we welcome you to visit our showroom at 247 Armstrong Avenue Unit #10 in Georgetown.